Peekapak is a monthly subscription service designed with educators to foster creativity and literacy. The box includes a storybook as well as a themed craft. All the materials and instructions you'll need are inside. Just open the pak, and start you're adventure. 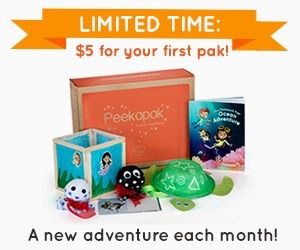 From now until November 02 you can purchase your first peekapak for just $5.00 when you sign up. You will be able to choose your first pak from among fan favorites. This is an awesome subscription box for lil ones. I will have to share this with my niece and my sister. Thanks for sharing. Interesting concept. I think my girls would enjoy something like this every month. Oh Love the deal!!! I wanted ti get a box like this for my Son for Christmas--I think this is a perfect fit! !